OldGreen wrote: HOLY CRAP. . .I haven't laughed so hard at work in a LONG time. Part 2 above. 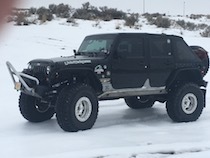 As to the armchair quarterbackery. . .You are absolutely correct in stating that I don't care about the body and that I know what my Jeep will do. The other side of the coin that you didn't mention but were probably thinking and/or saying is that I am absolutely out of my effing mind. That is correct. Just tryin' to have fun. I love to put the "sport" in our motorsport. . .
As I type that, I have to thank my friends and my Saint of a wife for tolerating me. Let me be clear (it sounds so trashy knowing our President uses it ALL THE TIME), our armchair Quarterbackery is only meant for entertainment purposes! PS. Keep this on the DL, EVERYBODY LOVES JIMMY, WHAT'S NOT TO LOVE? Last edited by Livin4Today on Fri Apr 25, 2014 9:59 am, edited 3 times in total. First my apologies, I had promised to keep the videos short. And it's done 3 days earlier than Ms Mandi guestimated! Orville is like a P-51 with a tail full of machine gun bullet holes. . . .